Church on the corner of Moody and Cherry Streets in Waltham. It's a warm and friendly place, particularly on Christmas night when the soup kitchen opens its doors to anyone in need of a hot, nutritious meal. The Bristol Lodge has been providing evening meals to people who are hungry, 365 days a year, for over three decades. In addition to offer- ing a daily supper, the Lodge operates an on-premise food pantry and a monthly mobile food program that stocks fresh produce and dairy products, as well as frozen soup and high-protein items, free of charge. 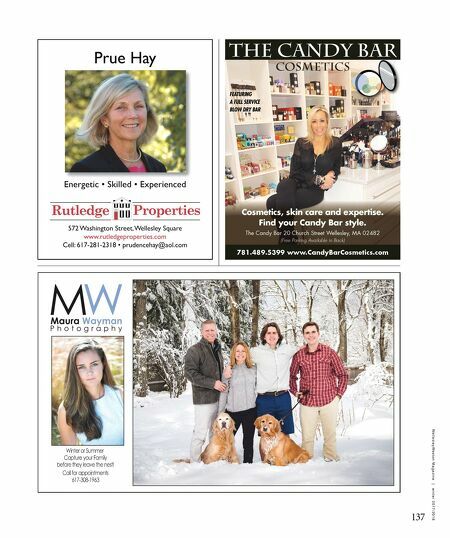 The Lodge is one of several programs in Greater Boston run by the Middlesex Human Service Agency (MHSA). Mary and her supporting cast of volunteers are staples at the Bristol Lodge. She has been organizing, preparing, and serving meals to the Lodge's dinner guests for over 25 years. 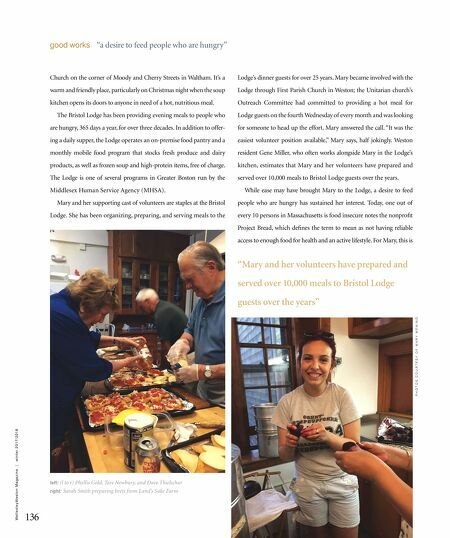 Mary became involved with the Lodge through First Parish Church in Weston; the Unitarian church's Outreach Committee had committed to providing a hot meal for Lodge guests on the fourth Wednesday of every month and was looking for someone to head up the effort. Mary answered the call. "It was the easiest volunteer position available," Mary says, half jokingly. Weston resident Gene Miller, who often works alongside Mary in the Lodge's kitchen, estimates that Mary and her volunteers have prepared and served over 10,000 meals to Bristol Lodge guests over the years. While ease may have brought Mary to the Lodge, a desire to feed people who are hungry has sustained her interest. Today, one out of every 10 persons in Massachusetts is food insecure notes the nonprofit Project Bread, which defines the term to mean as not having reliable access to enough food for health and an active lifestyle. For Mary, this is "Mary and her volunteers have prepared and served over 10,000 meals to Bristol Lodge guests over the years" P H O T O S C O U R T E S Y O F M A R Y M E N I N O left: (l to r) Phyllis Gold, Tare Newbury, and Dave Thielschur right: Sarah Smith preparing beets from Land's Sake Farm 136 W e l l e s l e y W e s t o n M a g a z i n e | w i n t e r 2 0 1 7 / 2 0 1 8 good works "a desire to feed people who are hungry"